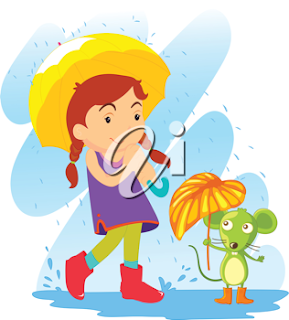 I have a daughter who loves to walk in the rain. Not in a raging thunderstorm, of course; that's just silly; but in one of those gentle English kind of sprinkles. Boy, is she happy this spring. Ask anyone around here and you will hear the same song. Everyone's singing in the rain these days. Spring, the season we yearn for, the season when we come out of hibernation to enjoy warming temperatures and sunlight, has been a bit of a disappointment this year. Waking to another rainy morning we glance hopefully at The Weather Network's long-term forecast and are delighted to see promises of sunshine. Our hopes, however, are ultimately washed away with the dawn of each new gloomy morn. It would be a good year, therefore, to try to discover the charm my daughter has found in a rain shower. And what would that be, you might well ask? There is something cleansing about the rain, she says. A stroll in misty or gentle raindrops makes her feel refreshed and renewed. A heavier pour is less pleasant, she agrees, but there is still an element of childhood pleasure to be found in the soaking you get, the splashing and sloshing you do. After all, if a rainy day is what we get, she says, we might just as well look at what's good about it and enjoy it. Yeah, I still don't know about that, but perhaps we can at least find some pleasure in these terrific collections of rain illustrations.